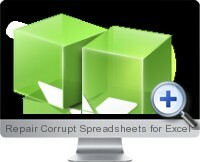 Repair Corrupt Spreadsheets for Excel (Excel Regenerator) is a recovery solution for lost, damaged, deleted, or overwritten Microsoft Excel documents. It efficiently recovers a separate lost workbook from an existing partition as well as lost excel files from corrupted, deleted partitions or reformatted disks. Ability to recover Microsoft Excel 97 to Excel 2010 version documents. Ability to recover deleted and overwritten documents. Ability to recover corrupted documents from entire disk instead of retrieving data from a single file, allowing to recover data even in the most desperate cases. The product ignores file system, scans disk at physical level. It supports all versions of FAT and NTFS and regenerates files even from lost, deleted partitions, and from reformatted disks. Auto save allows continuing recovery, terminated at any stage. When you purchase the full version, you can continue recovery, which was started by means of the trial version. A corruption implies that data has been lost. Many other data recovery programs recover corrupted documents from a single file. The result of such recovery is a file with probable data losses. In contrast to other recovery software, Repair Corrupt Spreadsheets for Excel regenerates Microsoft Excel documents not from a single file, but from the entire disk, without any losses of data. If a Microsoft Excel document was deleted, the program will scan the entire disk to find contents of the deleted file. If the contents of the workbook were overwritten, it will be regenerated from file fragments found on the disk. Repair Corrupt Spreadsheets for Excel supports all versions of FAT and NTFS and regenerates Microsoft Excel documents even from lost, deleted partitions and reformatted disks. The product can independently manage Microsoft Excel error messages, which may appear on your screen during the analyzing process.